The 12 Markers of Promising Practice describe evidence-based best practices in literacy and essential skills programming for First Nations, Inuit, and Métis learners. During the initial phase of FIMESIP (2011-2013), a list of 12 Markers of Promising Practice in Indigenous literacy and essential skill programming were identified. The 12 Markers were defined through extensive research and consultation that included the FIMESIP Literature Review, an analysis of over 100 Essential Skills initiatives, in-situ research on 10 case studies and consultation with Indigenous and education leaders on the Steering Committee, Working Group and Community of Practice. Each marker is described below. Indigenous control of Indigenous education/training and resource development has proven vital to increasing educational attainment and to the success and effectiveness of employment training initiatives. This is an essential guiding principle of Indigenous education programming and tool development. Building strong formal relationships with all stakeholders at all stages of the initiative ensures the best possible program design, planning and delivery. Partnerships provide opportunities for cooperation, exchange of information and sharing of resources among organizations with similar mandates and clients. Strong partnerships between ES initiatives and employers facilitate the integration of ES into the workplace and create ready-made networks and employment opportunities for clients. First Nations, Inuit and Métis community members need to be involved in all aspects of program/resource development and program delivery. Community involvement ensures that the initiative meets the needs of the community and that development and delivery models reflect the realities of the community environment. Community involvement ensures community buy-in and provides program participants with the support of community members, friends and family needed to maintain commitment. Working with communities includes building capacity and creating a continuum of training by supporting existing community resources. The learners’ needs drive program planning, development and delivery. Program structure takes into account and accommodates the learners’ lives. Assessment tools are used to assist participants in identifying their strengths and skills and to lay out a clear strategy for successfully meeting learners’ needs and goals. Participation is voluntary and learners are aware of all elements of programming. Programs create a safe environment where participants learn at their own pace, are not judged and are respected for who they are. Programs implement cost effective appropriate training and education methods to ensure that programs are sustainable for learners and their communities. Programming and resources take into account and meet the unique and multiple needs of Indigenous participants including the need for healing, empowerment and personal support. Programming takes into account the whole life of the learner, addressing any issues that may be a barrier to client success. Programming addresses all the client’s skill needs including ES, life skills, employability skills, career planning, job search, academic upgrading and technical skills. Training is targeted, covering the full range of skills necessary for long-term employment. Programs reach out to families and communities to ensure that all aspects of the participant’s life are considered, particularly if participation requires the client to be absent from their home community. Staff is aware of and sensitive to the unique needs of First Nations, Inuit and Métis learners. Staff is familiar with and respectful toward Indigenous peoples’ culture. Staff is experienced with employment-related training programs, understands issues impacting First Nations, Inuit and Métis trainees and the workplace and is flexible to these concerns. Instructors need to be organized, knowledgeable, skilled, able to build rapport, motivate participants and provide learners with successful learning opportunities. Programming is responsive to different learning styles and uses a wide range of instruction and evaluation strategies. Instructional methods focus on experiential approaches: doing, talking then reading rather the reading, talking and then doing. Learning is hands-on, interactive and has application to real world or workplace tasks. ES are embedded in the curriculum and taught within the context of both workplace and traditional activities. Modern training is linked to traditional values. Elders are invited to participate in the training and participants are encouraged to learn through the traditional methods of observation and imitation. 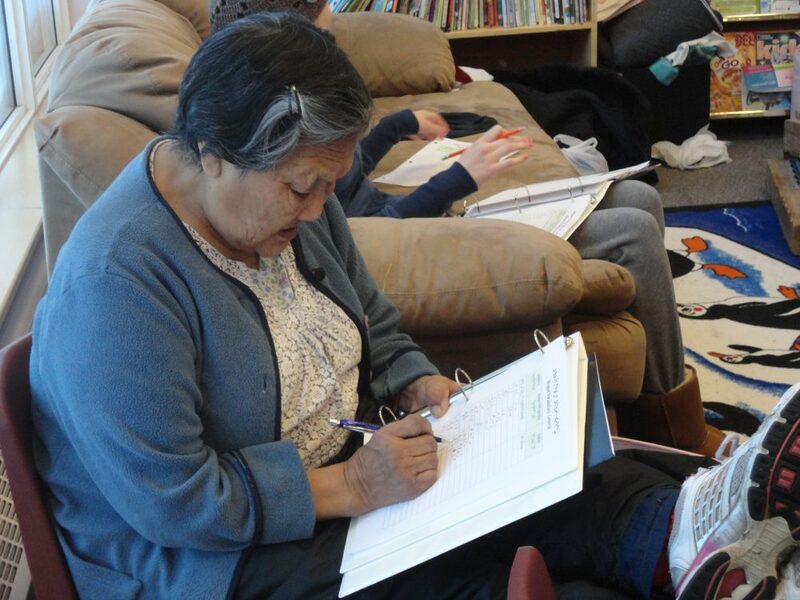 The community and Elders are involved in the development and delivery of programming. The program is sensitive to biases that appear in existing texts and uses or develops culturally appropriate materials. Participants are able to use their language and access content and resources in their own language. ES are explored within the context of traditional teaching methods, activities and resources. The program has direct links with employers and incorporates various work experience opportunities. The program assist participants to acquire job-related experience, learn about the workplace and develop employability skills. The program develops effective communication between trainees and employers. The program works with employers to coordinate participants’ transitions to the workplace, continues to support clients once they are on-the-job and provides diversity awareness training for employers to assist with creating a culturally aware work setting. A communication strategy is in place to ensure clear and on-going communication between all stakeholders. The communication strategy includes the publication of complete and detailed program reports. Evaluation is systematic, built-in from the inception of programs and continued throughout the initiative. Evaluation includes identifying, using quantitative and qualitative methods for collecting and analyzing outcomes data and demonstrating success. The initiative is sensitive to the needs and goals of employer partners. The initiative demonstrates to employers how involvement in the program benefits them. Successful participant outcomes are connected to successful business outcomes in order support employer participation and investment and to increase program sustainability.